2016 Ford Fusion Hybrid For Sale In Vernon, Kelowna, Okanagan, BC. No vehicle on the road combines environmentally-friendly power and an enjoyable vehicle quite like the 2016 Ford Fusion Hybrid. With mid-size space, value-minded pricing, and plenty of features, the four-door sedan produces a package that is stylish and smart. This model is available in three trims: S, SE, and Titanium. Handsome exterior styling of the 2016 Ford Fusion Hybrid is certain to turn heads. Creased sheet metal, hexagonal grille and swooping rear half give it a European flair, while the high beltline provides a distinctly American look in profile. It is modern, while having staying power with 17-inch wheels which are standard across the trims, either as 15- or 10-spoke aluminum wheels. Both the SE and Titanium trims feature power heated sideview mirrors with integrated LED turn signal indicators and blind spot mirrors. The Titanium trim level gets some special exterior features, including fog lamps and a rear decklid spoiler. A power moonroof is an option that makes driving more fun. The interior of the 2016 Ford Fusion Hybrid is just as stylish as the exterior. 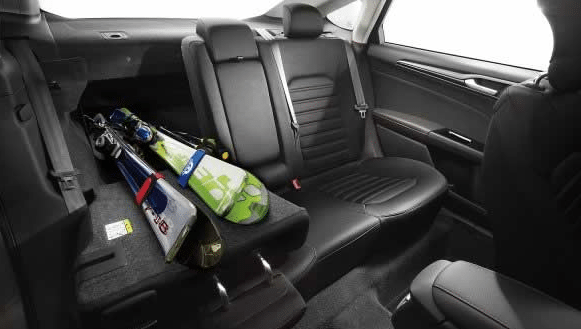 Seating for five includes cloth seats which are standard on the S trim, EcoCloth seats with REPREVE fabric standard on the SE trim, and leather upholstery standard on the Titanium trim. Leather is also used on the steering wheel and shift knob to add refinement. A heated steering wheel is available for the Titanium level for a little extra luxury. Front seats in the Titanium are heated, with cooling as an option, while the front seats on the SE trim can be heated as part of an option package. Dual-zone electronic automatic temperature creates optimal temperature levels for you and your passengers. For entertainment, the SYNC with MyFord Touch keeps you connected and informed with two 4.2-inch colour LCD screens in the instrument cluster and an 8-inch colour LCD touch screen at the top of the centre stack. 2 USB ports and an SD card reader provide more options and controls both the audio system and the optional navigation system. Listen to your music in style with a 6-speaker audio system or a 12-speaker Sony audio system for the Titanium. Working through a continuously variable transmission (CVT), the power plant of the 2016 Ford Fusion Hybrid combines a 2.0-litre engine with a lithium-ion-powered electric motor. Experience exceptional fuel economy and performance that is on par with conventionally-powered mid-size sedans. Keep track of your vehicle’s performance with the EcoGuide gauge cluster and improve your efficiency with better driving habits. The 2016 Ford Fusion Hybrid comes from one of the most celebrated lines of hybrid cars available with plenty of awards to its name. There are an incredible number of standard safety features on the 2016 Ford Fusion Hybrid, along with available advanced features. Enjoy driving the 2016 Ford Fusion Hybrid, which is backed by a Ford warranty. 2016 Ford Fusion Hybrid For Sale In Vernon, Kelowna, Okanagan Valley, B.C. With impressive affordability, both on the lot and at the pump, the 2016 Ford Fusion Hybrid is a clear leader in the mid-size hybrid category. It is proof that being environmentally-friendly can also be fun and stylish. Experience everything this classy Ford hybrid has to offer. Take a new 2016 Ford Fusion Hybrid out for a test drive today from your local Okanagan Valley Ford Dealer - Watkin Motors Ford and see just how it can fit your new car needs. Knowledgeable sales staff can answer your questions if this is your first hybrid or tell you what is new on the current model. No matter what you are looking for, Watkin Motors Ford makes buying a new car a lot more fun.